This system is called “The Materials Economy”, meaning how materials become goods and enter the market for people like you and I to buy with money…and eventually get thrown away. What’s missing from the above system? People. The video goes on to explain how much a variable people are in the equation and some other really cool stuff. But this all got me thinking and somehow my brain ended up at the organizational chart (org chart for short). Above is a typical org chart for a nonprofit organization. The chart does not vary much between organizations and really doesn’t vary much even in the corporate and government worlds. We’ve all seen these before – we’re all a part of one whether we’d like to be or not too. These charts are good for a few things: A) Very clear lines of communication B) It is very clear who makes what decisions and C) Helps people understand how the organization/company operates. What these charts don’t do however is what caught my attention. Org charts have been around for a very long time. In this “information era” we’re in now, it has become apparent that lines of communication are now much shorter and a hierarchy in the workplace is much more complicated than it appears to be on paper. And especially within the past eight years or so, lines between positions have become blurry and employees take on many more roles than a org chart may dictate. If you’re the Accountant, you’re not typically sitting behind a calculator all day. Especially in the nonprofit world, you are typically assisting with mailings, setting up for events, proof-reading marketing materials and maybe stepping in the board meeting to take minutes. The way organizations and companies have developed internally is making us all stop and re-assess how information flows between employees, from customer to CEO and from the government to the public. The internet has made all of those lines much more shorter, and much more public. Aside from the literal changes in recent years – the environment of how our economy functions has shifted. America has shifted from an industrial based economy to a innovation based economy. Now we can discuss the political reasons why one may be better than the other or how we support those, but we’ll save that for the Christmas dinner table. And this isn’t to say that we’ve stopped producing goods – but we have become much more centered around efficiency, company culture, and employee satisfaction. There’s a reason people want to work at Google and there’s a reason we don’t make children work the line at Boeing (Newt…..). We have spent the last 100+ years focusing on making our products great and now we’re focusing on how to maintain that greatness and better our image. Whether we realize it or not, we are shifting to a “creative economy” – where creativity becomes the driving force behind economic success. Now I’m not going to explain the “creative economy” today, though I might in the future, but I wanted to point that fact out because I believe it is the root of change needed when looking at restructuring our organizational charts and our economic flow charts. When putting this together, I started with just the org chart but suddenly realized that with this new spin on a classic, you can add in how the economy tends to fluctuate and, more importantly, how organizations and companies react to those changes internally. This new model demonstrates that at the heart of every business entity lies the Public, or the Audience. They are the target for all products and services. Likewise, the driving force behind every business is the “Idea”. The “Idea” is not the final product, but is the need that a product or service addresses. For instance: “I want to go from here to there,” is the idea, and the “Car” is the product for the public. How an idea gets from thin air to the Public is the exciting part that we all have a role in. We look to “Creators” to take an idea and make it visual – sketching it out, making a model, etc. The “Creators” are the artists that take the intangible and make it visible and tangible. These are the members of the “creative class” – designers, architects, artists, musicians, sculptors, actors, designers, etc. The “Creators” then take their idea to the “Assemblers” in their company. These are the folks who take the interpreted creation and turn it into a specific product. These are the engineers, craftsmen, department heads, etc – the people who have the ability to take an artists’ interpretation of the “Idea” and turn it into a blueprint or a plan. The “Idea” then gets passed on to the “Presenters”. These guys take what is now a product and polish it over – the directors, financial officers, marketing execs, the testers and troubleshooters, etc. They make sure that the product will fit with the “Public’s” needs and layout how to get the product to the “Public”. They are the last line of defense before the “Public” sees the product. 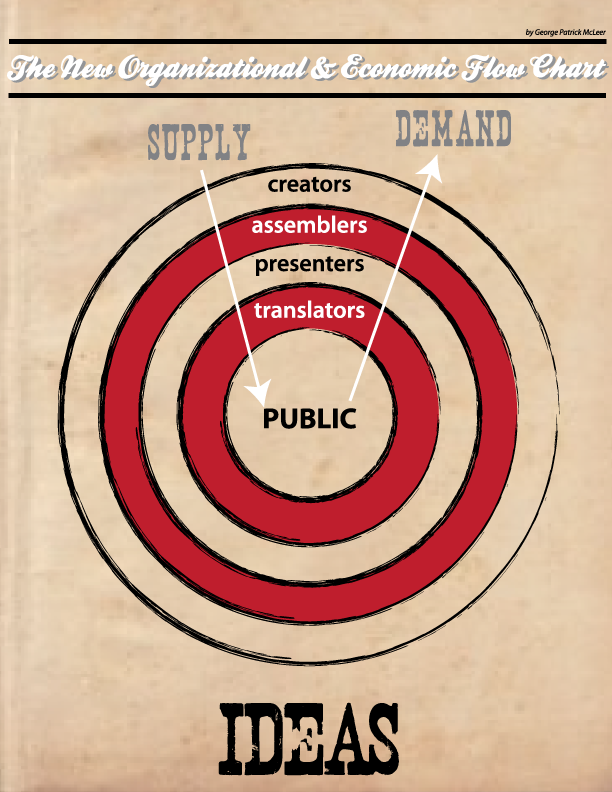 The last place the “Idea” turned product comes to before the “Public” gets a hold of it are the “Translators”. They are the bridge between the business and the “Public”. They are responsible for ensuring the “Public” is informed of the product, buys the product and uses the product. They know their target audience better than anyone else and have to make sure that never changes. Once the product hits the “Public”, you have entered the market…and you pray. The relationship between the different groups is not linear like the original org chart. This model conveys a culture of collaboration and creativity. No specific “business title” is named – anyone can be anywhere in the model at any time. The CEO might be the “Creator” for one product and the “Translator” for the next. No one is bound by their “box” like in the old model. This also gives a great visual for how the economy works in a very simple way. A business supplies the market with a product and the public demands products from the business. The relationship is reciprocal, something this model illustrates and previous models did not. The model highlights the collaborative nature of business these days and embraces a strong focus and connection to the public – something that seems to be lost in many big companies and in many long-standing organizations. Supply and Demand directions apply to the workplace as well. Each member of the group can at any point demand and supply a product or idea to the next. With the old model, demand was in one direction – top, down. The CEO demanded an idea from the graphic artist. But in the new model, the graphic artist can supply the CEO with ideas at any time. They can also demand ideas from the Public. All of this can easily be applied to a nonprofit organization just as easily to a corporate model. Now, I’m no economist, but I feel that this new model for organizational charts is great reflection of reality in the workplace during this century so far. I know I’ve experienced it, noticed it and embraced it – and maybe you will too.